Survival Guide to Visiting Italy - for Singaporeans! Singaporeans do not require a visa for entering Italy as tourists. If you have other reasons for going there (such as business, research, formal studies, a job attachment or long-term employment) then please contact the Italian Embassy. €5 €10 €20 €50 €100 €200 €500. As a visitor, the largest note you should ever need to carry is €100, although €50 notes are probably more convenient. For a few years now, this the exchange rate has been slightly more than S$2, but over the last few months the euro has been gone below that a few times. For the latest exchange rates, click here. You should change your cash in Singapore, where the rates are much lower than in Europe. While it is easy to use your credit card to get cash from an ATM, not only do you pay a much higher rate to begin with, you are also charged a cash advance fee which can be in the region of S$25. Besides, why even bother wasting your time looking for an ATM while you're there? From personal experience, you should budget between S$150 to S$200 a day for your trip. This excludes flight costs, and assumes an average level of comfort which, while not particularly luxurious, should be adequate to cover your hotel accommodation, transport and meals, with spare for entry fees and snacks. Assuming a typical Asian appetite (my own), meals in a decent restaurant should cost average of S$50 for 1 to 2 courses plus a side dish, wine, and dessert, and could go up to over S$200 if you are dining in an upmarket establishment in one of the major cities like Milan or Venice. (For your information, a certain 5-star hotel in Venice charges about S$110 just for the buffet breakfast...) On the other hand, a decent pizza and a beer would probably cost you in the range of just S$12-20, which is much better value than back home! The estimation above will change with the seasons and the area of travel. Generally, accommodation costs are highest during the summer months and will be at their lowest in winter (there are exceptions to this trend which I shall not go into here). Also, the further south you go the lower prices tend to be. Obviously, the amounts mentioned above will not cover shopping, and believe me, this you shall be very likely to do. We are not talking about just clothes, handbags and shoes here. The sort of things you are likely entice you to bring	back home are plentiful, ranging from the highly spiritual to the nutritionally sinful, from crucifisses to cheeses and chocolates, so go prepared with some additional budget to splurge on these. I personally do not to carry much cash with me and prefer to use my credit card wherever possible. €500 should be the maximum to carry in cash per person for a 2- to 3-week trip. I might even make do with just €300 by being very careful with daily spending, or if I pool my cash with my travel companions. There are also many well-traveled people who prefer to do just the opposite, that is, carry plenty of cash and avoid using their credit card as much as possible. There are a few advantages to this approach. Exchange rates imposed by credit card companies are higher than average, which means that overall expenditure in local currency will ultimately be higher with the use of credit cards. Also, with cash around, you will still have some back up support should your credit card be lost or damaged. What to wear and what to pack. There is no need to take along a pair of flippers even if you are spending a week in a spa hotel. Always travel light. What you take with you should fill no more than a small suitcase and a rucksack, whether it's for a week or four. In fact, the basic trick is take enough for just 1 week's change of clothing, and most of that will be inner wear: your underwear, the socks/stockings, T-shirts and so on. It's much more convenient to have these washed while you are there, either at a self-service laundry or in your hotel room, than to have to carry all that dirty laundry around with you for your entire trip. Most of the outer wear wouldn't need to be washed every day in any case, so you would just need enough for just 3, maybe 4, changes, and if you coordinate your items you could mix and match them with even less than that. You wouldn't need to take that much with you even in wnter. In fact, you might even pack less into your suitcase because you won't be taking along the many polo-shirts or blouses which you would otherwise be forced to do during the hot months. Your largest and heaviest item would be your overcoat or jacket, which you will have to take by hand as you would need to wear it once you arrive. Your few cardigans and pullovers will take up space, but they also weigh a lot less than the equivalent volume of summer clothing. The cobbles of San Gimignano were not laid for walking with stilettos on. The right shoes can make a difference between enjoying your trip and wishing you hadn't left home. Always remember that when you are travelling you shall be walking much more than than what you would normally do in your daily life back in Singapore. And when you are in Italy, you shall most definitely be walking a lot if you really want to savour your experience to the full. A good pair of leather shoes made for walking is indispensable. They look much better than athletic shoes (and you don't really want to look like a typical sua-ku Asian tourist, do you?) and they are much healthier for your feet. And if you intend to attend concerts and operas—no problems— unless you are attending the gala opening night at La Scala in Milan, no one will look down on you for not wearing dress shoes. Note that restrictions on the amount of liquids carried by hand are still in force. The main thing to remember is that only containers of liquid, aerosol or gel of a capacity no greater than 100ml will be allowed to be taken on board, and that all such items must kept in a single closed transparent re-sealable plastic bag of a capacity not exceeding 1 litre. Note that it is the container and not the actual amount contained within that is being regulated. 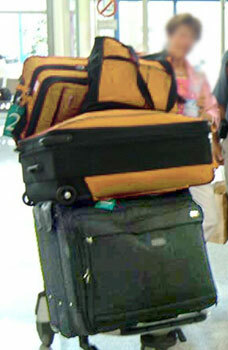 Anything which does not comply with these requirements will have to be packed with your check-in luggage. For more information on this, you can check the Changi Airport website by clicking here. 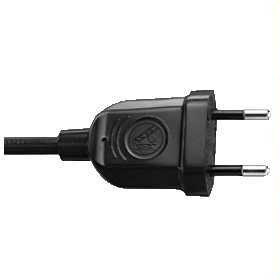 Italy uses a 220V current and a 2-pin European plug like the picture below on the left. This voltage is compatible with appliances used in Singapore, and many smaller appliances in Singapore like hairdryers are already equipped with this type of plug. 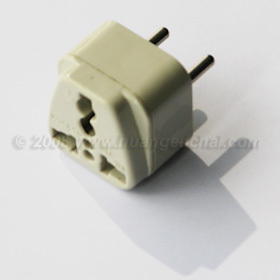 For items using a standard British 3-pin plug, all you need to bring is an adaptor like the one shown below at right, which you can get at any shop selling electrical items. For cameras, electric toothbrushes and other equipment using standard off-the-shelf batteries, do note that these batteries are much more expensive in Italy than they are in Singapore, so you might want to consider taking spare batteries with you, or else use rechargeable ones and take your charger along for the trip. Everyone should buy travel insurance, regardless of whether you are travelling to Italy, Canada, Egypt or Kuala Lumpur. It is a negligible sum of money to pay for guarantee of some form of compensation should the unexpected occur, from delayed luggage to seeing a doctor for an upset stomach, and you will be very glad you did. All major insurance companies offer policies for travel. © 2009-2011 Huang Eu Chai. All rights reserved.